​The XS128 Machete Wheels rip through the limits as they thrive on the dirt and chaos of extra-duty, off-road racing. These wheels designed by KMC are built for those who need precise equipment for an imprecise environment. The Machete is a light-weight, yet strong, race-tested wheel that is always looking to take on a challenge. 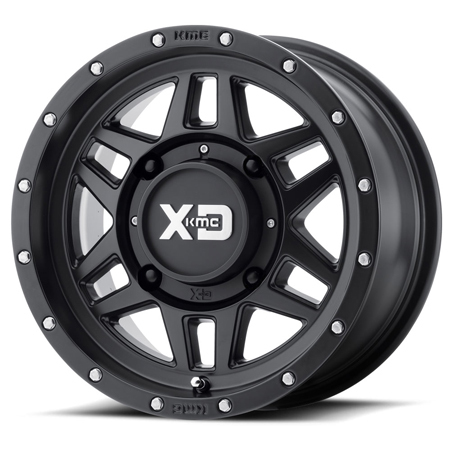 ** The 5+2 offset wheel (+35mm) keeps the factory stance width and offset close to most OE specifications (newer Polaris, Can-Am, Yamaha side by sides). The 5+2 offset is also recommended for Sportsman 550/850 XP machines, RZR 900 and RZR 1000 machines to keep the original factory stance width and same splash protection. 14x10 rear wheels are typically used for sand applications with wide rear tires.